Country singer Rockie Lynne has been announced as a featured performer during Princess Cruises’ first-ever fundraising cruise to support U.S. veterans. Lynne, a veteran himself who frequently supports military causes, will perform with his five-piece band during the November 5-9 sailing. Lynne’s debut single, “Lipstick,” spent an impressive 10 consecutive weeks in the #1 slot on Billboard’s Country Singles Sales chart. He is also co-founder of an annual charity motorcycle ride called TRIBUTE TO THE TROOPS, which has raised more than $250,000 in aid to families of the fallen. One third of the proceeds from his new album, “Songs for Soldiers,” will benefit troop-related charities. 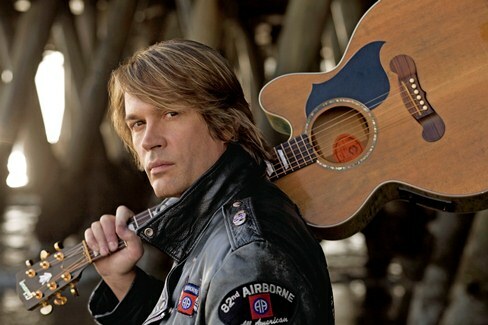 The inspiration for the album was his 21-day tour of Afghanistan, Southwest Asia, and The Persian Gulf, where he and his band entertained U.S. troops stationed abroad. During the cruise, Lynne and his band will be headliners in the ship’s Princess Theater, and will also offer an up-close performance in Club Fusion. The groundbreaking sailing will raise funds for two respected veterans’ organizations – Vietnam Veterans Memorial Fund Inc. and Operation Homefront Inc. The voyage sails roundtrip from Houston aboard Caribbean Princess to the Western Caribbean, and is expected to generate $1 million for the two charities. Lynne joins a number of special guests who will be aboard the cruise, including former chairman of the Joint Chiefs of Staff, Admiral Michael Mullen (Ret. ); retired senior officers from the Army, Navy, Coast Guard and Air Force; an award-winning war correspondent; and other respected speakers, authors and panelists. More information and the latest line-up of special guests can be found at http://www.princess.com/cruisingforacause/veteranscruise.html. The cruise will offer passengers the opportunity to honor those who have served in the military as well as active duty military personnel. In addition to Lynne and the line-up of impressive military guests and speakers, there will be special performers, celebrities, unique topic panels and a military film festival. Princess will offer onboard activities such as a Stars and Stripes Sailaway, a Red, White and Blue Gala, and more – to celebrate U.S. veterans. Also throughout the voyage, representatives from the Veterans History Project will be onboard to assist veterans interested in working with families and friends to record personal accounts of their service experience for preservation with the Library of Congress. Cruise fares range from $499 to $1,849 per person based on double occupancy. A portion of each passenger’s cruise fare expected to reach approximately $500,000 will be matched by Princess Cruises for a total of $1 million earmarked for the two veterans’ organizations. As part of Princess’ ongoing Military Cruise Benefit Program, active and retired military personnel choosing to book this cruise will receive a $50 onboard credit. The cruise launches Princess Cruises’ new “Cruising for a Cause” initiative where the company will dedicate entire sailings to support select charitable causes. This new, industry-leading program will provide the line’s passengers, many of whom are looking for opportunities to make positive contributions to their communities and the world, a way to make a difference even as they vacation. More information about “Cruising for a Cause” sailings can be found at princess.com/cruisingforacause or by calling 1-800-PRINCESS.